Can't think of a Romantic Gift Idea to Give Your Loved One for Valentine's Day? It's time to start thinking out of the box when getting a gift for him or her..what about an amazing, affordable oil painting portrait from a photo? Flowers, chocolates, clothes, and video games --- these are just some of the typical romantic gifts to give to your loved ones during special occasions like their birthdays, anniversaries, and the Christmas holidays. Yes, you love your girlfriend and yes ,you want to get her something special but wouldn't you get tired of the same old gifts which you've given for the past couple of years already? If you want to give your special someone something different, you're going to have to think out of the box this time and get her a romantic gift that she normally wouldn't expect from you. One of the most popular unique romantic gift ideas is getting your loved one a painting. There are hundreds of oil paintings done by professional artists, each with its own special message. It may be love, it may be destiny, who knows? What's important though is being able to bring any room to life no matter what. There are many paintings that you can give as gifts to her on your special day and Direct Art Australia has a whole gallery for you to look through. 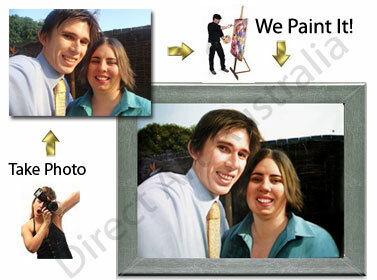 If buying a regular oil canvas painting won't do the trick, perhaps you'd like to buy your loved one a romantic and special portrait from photo? It's a special service wherein your photos are turned into beautiful portraits and framed to be hung on the walls of your bedroom, dining area, living room, etc. A portrait from photo is great romantic gift idea because it not only is special and unique but it sure is memorable since the painting was taken out of a special memory like a wedding photo or a photo taken when you two went on your first date. There are also many famous paintings done by famous artists and your boyfriend might be a fan of one. You can get him a famous reproduction that is close to perfection and marked at affordable prices. You won't have to worry anymore about searching online and paying a fortune just to have the painting of his favorite artist on the wall since you now have a quality reproduction of it in your hands. And because of this, Direct Art Australia aims to bring to you a series of famous reproductions of various classical painters such as Van Gogh and Gustav Klimt right at your doorstep. Impressive romantic gift ideas like these are just a click of a button away, so whenever you are ready just browse through our galleries, place a painting or two that you'd like to give as a romantic gift to him or her into your basket, and check them out with ease and assurance. We at Direct Art Australia will make sure to make this special surprise an amazing one that will bring more sparks into your relationship! Note that we ship for free to all locations in Australia including Melbourne, Sydney, Brisbane, Perth, and Adelaide.